A Münter is a hitch that is tied onto a carabiner. You can use the Münter as a descent control "device" (aka a "DCD") when lowering a load or rappelling, or you can use it as a belay device which allows you to take in slack while being ready to catch a sudden load. An advantage of a Münter hitch is you don't need any additional hardware. A disadvantage is it twists the rope. 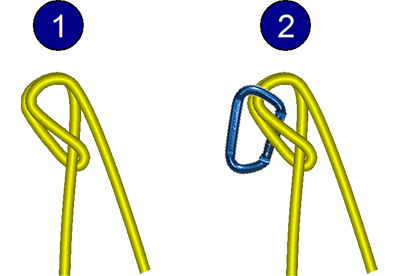 The twisting usually isn't significant if you rappel once or twice, but if you use the Münter repeatedly the twisted rope can become a real pain. There are several different ways to tie a Münter. In this first method, you fold the rope on itself and then clip the two strands with a carabiner. In this second method, you run the rope through the carabiner, create a loop, and clip the loop. 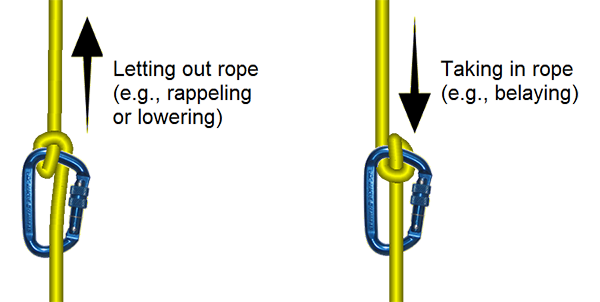 The Münter has the unique ability to change between a descent control device and a belay device. When it switches between these modes, the hitch changes its position on the carabiner.